Home » News & Blogs » Business serving society? In addition to addressing climate change impacts and working within natural resource limits, we propose that a new local economy integrates business not just with the natural world, but also with society, creating value that is shared more equitably, offering opportunities for everyone. Note. This suggested feature of the new economy is one in a series. None of the features suggested come without contention or need for increased knowledge and understanding. We present them as suggestions and as works in progress and invite you to enter the discussion by rating each feature, adding your comments and where possible suggesting additional content. Also please let us know if there are other models that would be essential features of a new economy which aren’t here yet. This is an approach to businesses’ relationship with society, which seeks to find opportunities for shared value for both society and business. Businesses invest in social aspects of their environment that also strengthen their competitiveness e.g. training and skill development. A symbiotic relationship develops: the success of the business and the success of the community become mutually reinforcing. The more closely tied and relevant a social issue is to the organisation’s business, the greater the opportunity to leverage the organisation’s resources and capabilities, and benefit society. 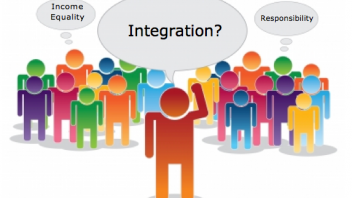 Such businesses may be termed ‘Integral’ as they are seeking new levels of integration of their purpose and operations with society. Whole Foods Market may be considered one of the largest Integral businesses in existence today, which is both “successful and good”. 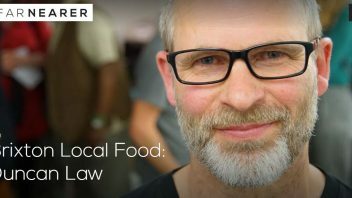 In other words, mirroring the aim of most traditional businesses, Whole Foods is consistently growing and has been economically prosperous, and though the bottom line is extremely important, it’s not the sole consideration of success. The extraordinary combination of success and ethics that Whole Foods provides makes it both an exemplar as well as a trailblazer for other Integral businesses to follow. Here’s a 10-minute interview with John Mackey, Chairman and CEO of Whole Foods Market, a $4 billion Fortune 500 company, the largest natural foods retail chain in the world, and a “Fortune 100 Best Companies To Work For” for 8 years running. Not every business can build its entire value proposition around social issues, but adding a social dimension to the value proposition offers a new frontier in competitive positioning. As a result, the number of industries and companies whose competitive advantage can involve social value propositions is constantly growing. Even large global multinationals have decided that major business opportunities lie in integrating business and society. 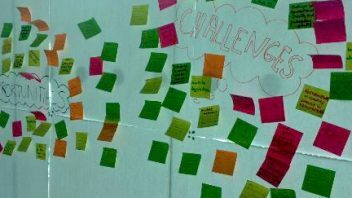 Companies are called on to address hundreds of social issues, but only a few represent opportunities to make a real difference to society or to confer a competitive advantage. Organisations that make the right choices and build focused, proactive and integrated social initiatives in concert with their core strategies will increasingly distance themselves from the pack. “Instead of the goal of maximum linear growth in GDP, we should be thinking of maximum wellbeing for minimal planetary input. That starts to challenge business to go beyond efficiency gains, useful though they are, and really redesign their business models. 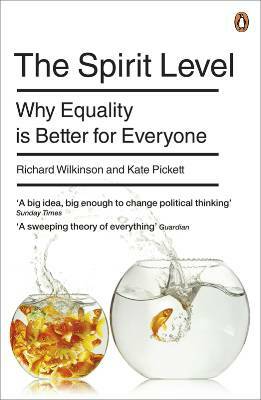 The book The Spirit Level attempts to articulate the view of interdependence and that social equality makes for much healthier societies, businesses and economies overall. Income inequality is increasing in the UK, with the very rich becoming richer and the very poor becoming poorer. Relative poverty is highest in the west Midlands and lowest in the SE of England. (Institute for Fiscal Studies, 2011) Studies find links between the amount of trust, social cohesion and social capital in a community or society and the amount of income equality. 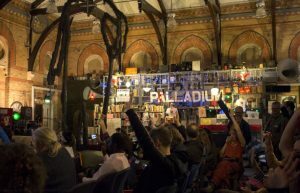 With profits distributed equitably within organisations and throughout the value chain, fair trading and employment practices, and wider community ownership models, greater income equality can be achieved. As discussed above and in the section on Natural Capital, if profits are also reinvested in developing the social and natural environment (e.g. in skill development, and in supporting biodiversity and healthy ecosystems) then the organisation is also investing in its future viability. The changes we are talking about on this page require paradigm shifts! Just like with this picture, some people see a duck, some people see a rabbit. Some people can shift from one to the other. 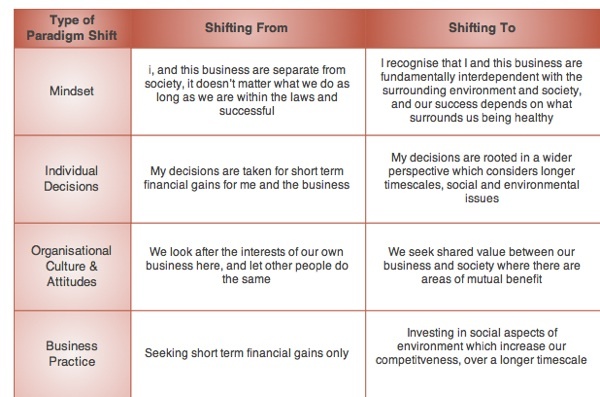 Shifts are required in different dimensions of people’s lives: in individual mindsets of how people see the world; in behaviour and decisions we make as individuals; in our culture, attitudes, shared values; and in our business practices. This table below outlines what we might be shifting from and shifting to, in each of these areas. There are tools and models which can help us initiate/lead/facilitate these types of paradigm shifts. This video describes one, called Tribal Leadership. CAUTIONARY NOTE: If you are going to watch this, you will need to do a bit of translating. This video is aimed at people wanting to make their organisations more successful and perform better. But if you watch it through the lens of ‘how can we use this understanding to help with the paradigm shifts above?’, then it becomes relevant to this topic. And this is a blatant marketing video for the book: we are not advertising the book here, more inviting you to the challenge of applying this perspective to the paradigm shifts above. The 10 minute interview with John Mackey of Whole Foods is not available on the given link. Thanks.